Life with two young kids is so chaotic that I don't actually remember sprinkling kale seeds in one of our raised garden beds this spring. But I must have because we're afloat in a sea of ragged jack kale now. It's gorgeous stuff -- wide, silvery green leaves with slender, dusky purple stems. The plants are so prolific that it's a struggle to keep up - a stark contrast to last summer when soft, green cabbage looper caterpillars would devour the plants within hours if I wasn't out there pulling them off and squishing them - an experience that I find to be equal parts gross, guilt-inducing, and thrilling - multiple times a day. In addition to kale salads, kale chips (stay tuned for the results of my latest experiment - I tried out eight different flavors!) and just chopping, blanching and freezing bunches of it for the winter, I was looking for some new ideas. 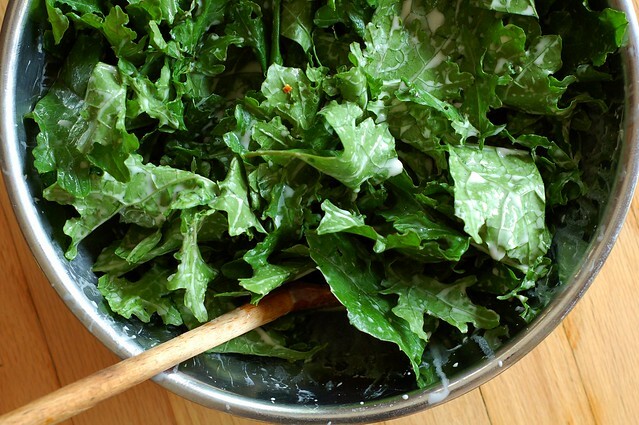 My friend, Pat, responded to my call for kale inspiration by sharing this recipe along with a short note, "Try this--it sounds like it won't work, but it's delicious." So I tried it and, of course, he's right. There is something a little weird about marinating kale in coconut milk spiked with lime juice and spices for hours and grilling it. But there's nothing strange about the pile of slightly charred greens you'll be left with at the end of the process. 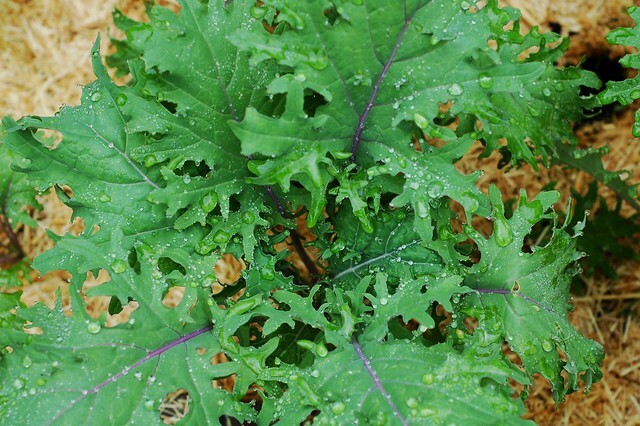 The kale has a remarkable flavor - smoky, rich, and complex. It's not hard but you do need to start it earlier in the day to allow time for the marinating. First step - get yerself some kale. If you're not growing your own, lots of people around you probably are so check your local farmer's market or scan the roadside farm stands. Wash it and remove the leaves from the ribs. 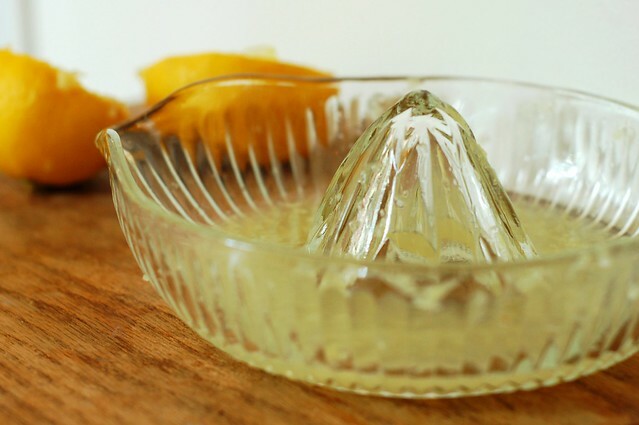 This is actually pretty easy and you don't even need to use a knife - in fact, it's easier if you just use your hands. 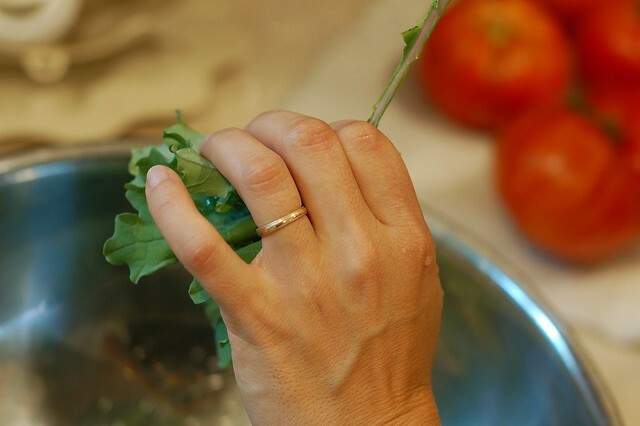 Grasp the leaf in one hand and grab the rib in the other, then pull down from the bottom of the leaf to the top. You should be left with the leaf in one hand and the rib in the other. I'd recommend not slicing the leaves since it is much easier to grill them in large pieces. 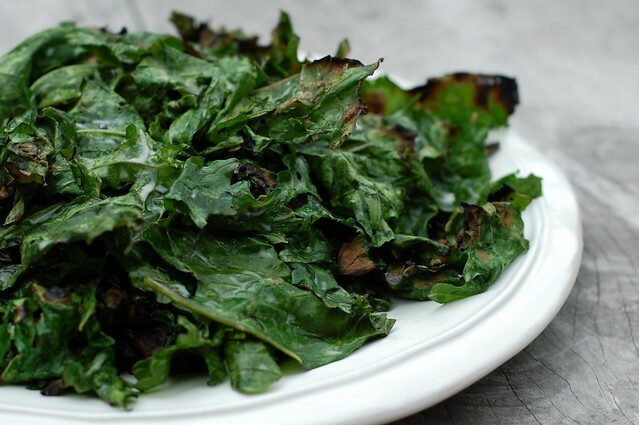 Dinosaur kale may actually be the best choice for this dish since it's tougher than other varieties and can stand up to grilling a bit better. Then make your marinade. Start by juicing a lemon. 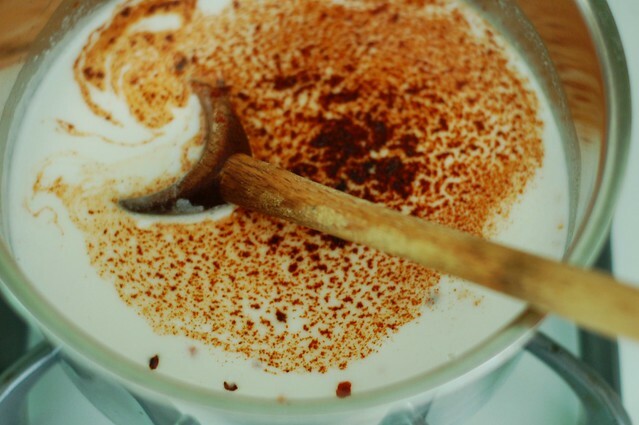 Heat up the coconut milk until it softens then add the spices and the lemon juice and stir. 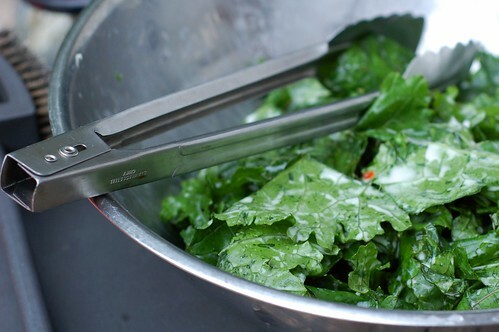 Mix the kale with the marinade in a large, non-reactive bowl making sure it all gets well coated. Cover it with a big plate or a plastic bag (I'm not a fan of plastic wrap) and let it sit for four hours, turning a few times. Then it's grilling time! Fire 'er up and clean your grate. Bring your tongs and a plate to put them on as it's a very quick grilling process and you won't have time to run back into the house for anything once you start. 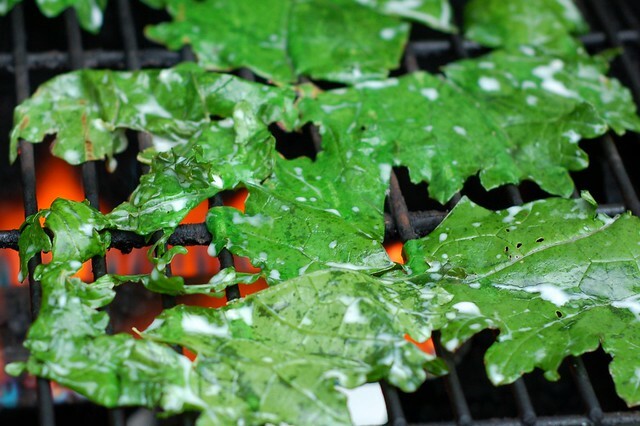 Once you've got a nice even medium-high heat going, lay the kale leaves on the grill for between 30-60 seconds, then turn them over and repeat with the other side. Some of mine burst into flames but I just blew them out and carried on. 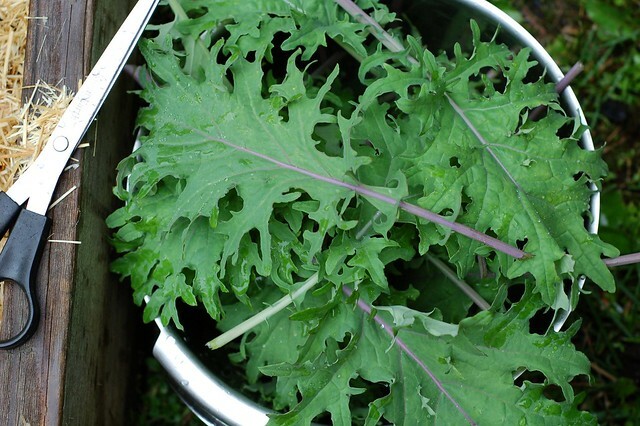 I think the dino kale probably can withstand slightly longer grilling (we're talking seconds here) since it is thicker and tougher. 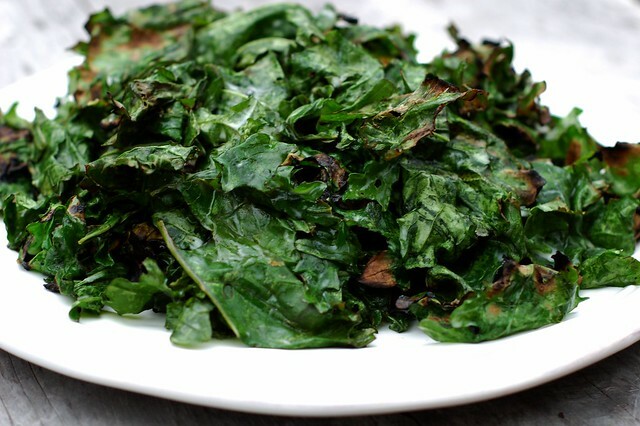 You'll have a pile of gorgeously charred, lightly spiced, coconut kale. Since I can't stomach the idea of tossing out a whole bunch of perfectly good coconut milk, I used the leftover marinade to make a delicious curried coconut basmati rice with cinnamon and currants that I've adapted from the Moosewood Restaurant Cooks at Home cookbook and hope to post about someday soon. The curried rice went perfectly with the grilled kale and grilled ginger-lime shrimps I made. 1. Rinse the kale thoroughly (I counted no less than 19 green caterpillars in the water I used and while they're a great source of protein, I'd rather skip eating them.) Remove the ribs from the leaves and put the ribs in the compost or set them aside to use in your next batch of homemade vegetable stock. Hooray for kale! I love the idea of mixing it up with coconut milk for an easy yet different veg side.